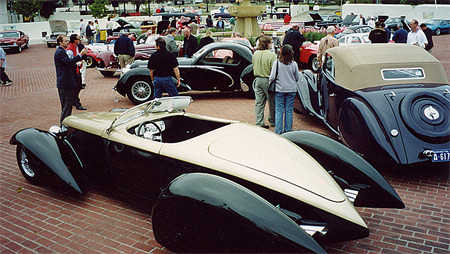 DECO's "BUGNOTTI" Maserati powered Boattail in the foreground (sold for $110,000) flanked by a 1937 Bugatti Type 57 Stelvio Drophead Coupe (sold for $365,000), a 1938 rebodied Mercedes-Benz 540K Special Roadster (sold for $1,017.500) and a 1938 Talbot Lago T150-C Teardrop coupe (sold for $3,685,000) at the RM Auction Monterey-Pebble Beach Auction 2005. My consummate passion in life is hot rods combined with classic automotive styling. I've been fortunate enough to travel the United States and visit great automotive museums like Auburn-Cord-Dusenberg, Nethercutt, Gilmore, and Blackhawk. I've been to a zillion rod runs but also visited fabulous Concours d'Elegance events like Pebble Beach, Amelia Island, Meadowbrook, Reading/Lehigh and the Louis Vuitton galas and Italian Avant-garde in Car Design in Manhattan. I've traveled to Europe and visited the great classic car museums like Beaulieu in England, the Mercedes Museum in Stuttgart and the Schlumph collection in Mullhouse, France, and others. I've devoured dozens of magazines and books on classic cars and hot rods and spent hours surfing the Internet chasing down and consuming swoopy automotive shapes. 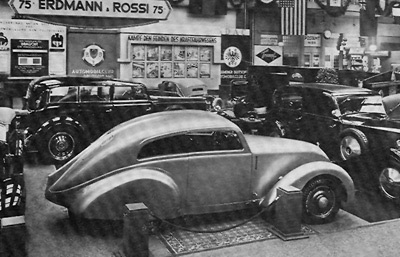 German Coachbuilders Erdmann & Rossi and their chief designer Johannes Beeskow rocked the automotive world with their streamlined fastback at the 1933 Berlin Auto Show, then followed up in 1935 with this fully enclosed front and rear wheel Mercedes Roadster. I believe these cars must have influenced illustrator Geo Ham and subsequently Joseph Figoni, inspiring the succession of Figoni & Falaschi enclosed pontoon streamliners. My heroes are the great European automotive coachbuilders from the 30's like Guiseppi Figoni and Ovidio Falaschi, Jacques Saouchik, Van Vooren, Erdmann and Rossi, A. F. McNeil and J. Gurney Nutting, as well as the French airplane and car builder Voison. I've been influenced by designers E. L. Gregory, Al Leamy, Gordon Buehrig, and clay modeler Vince Gardner. Harry Westergard is another of my heroes. In more recent times the works of Larry Shinoda, Larry Erickson, and John Hurlitz have changed my life. These are men with a God given gift, men with an "eye" for design. Hot rods like '32, '34, '37 and '40 Fords are absolute things of beauty, but when I go to a big rod runs and see literally hundreds of them, they all begin to look the same. I crave any car that has the right "look," but at the same time is fresh and different. I love the great classic marques like Auburn, Bugatti, Cord, Delahaye, Delage, Deusenberg, Maybach and Talbot Lago. To me the best-looking cars were built in the mid- and late 30's before the slab-sided look arrived, back when fenders were distinct and separate design elements. My mission in life is to create cars that start with the best looking classics ever designed, then give them the hot rod treatment. This can only be done with a team of people and help from friends. I'll be the first to admit we are copying or starting with other people's work. But we're dragging these 1930's classics into the 21st Century with a hot rod flavor, gusto and verve. In doing so, we're paying tribute to these great stylists and craftsmen. The first step towards creating DECO RIDES was the 4 1/2 years spent with Ramsey Mosher of Dover, DE building the SCRAPE Zephyr. Starting with an E. L. Gregory design, I redesigned it and Ram built it. During that period I wanted to cut the roof off and make it a convertible since I felt it would make a stunning ragtop. But the "architecture" of the chopped coupe roof was too beautiful to cut off. So I decided to make a fiberglass mold off the coupe and slice the roof off a glass car. That's how DECO RIDES began in 1999. The Zephyr coupe and convertible have lead to fooling around with other variations on the SCRAPE theme (sedan delivery. fastback, etc., presented elsewhere in this website). The second major project, building a car from scratch involved 4+ years of work. 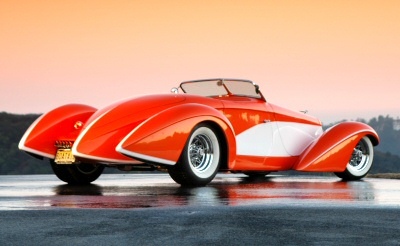 The DECO RIDES Boattail Speedster finally emerged from the molds and the first car was completed in July of 2004. Much of the credit for the Boattail goes to Mike Ball of Syracuse, IN who did the majority of the buck work and all of the mold work. Rob Ida came up with the pivoting pontoon idea and did some preliminary buck work. Other friends like Don Boeke, Ken Fenical, Ed Golden and especially Dave Draper gave me advice and encouragement along the way and deserve credit. And I never could have done it without the support of my wife Virginia. You can see from the Daryl Mayabb sketches, messing around with variations on the Boattail theme opens a plethora of other fun DECO RIDES. 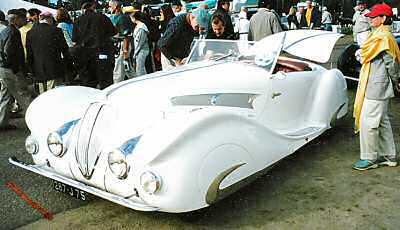 I've embarked on another "quest", a project that will probably be the apogee of my life's work, see DelahayeUSA.com. If you've noticed the DECO RIDES logo art that I've used since I started this company, one "cluster" of cars have really captured my fancy. 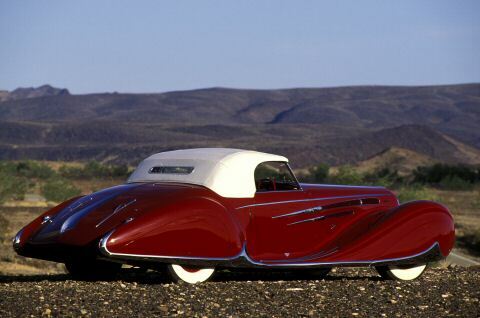 Because one of you who read this website believed in me enough to finance the project, DECO RIDES is now, together with Sean Halpin, Steve Pierce, and Joe Stafford, completing a computer designed wood buck and building a very upscale aluminum bodied, modern rendition of the Figoni & Falaschi-bodied Type 165 1939 Delahaye. Right behind it will be another aluminum bodied "clone" of the Van Vooren bodied Shah of Persia Bugatti. We hope to debut the Delahaye at RETRO AUTO 2008 in Pebble Beach, but we've got a lot of work to do between now and then. There are other cars that will surface from DECO RIDES before and after the Bugatti/Dalahaye, such as the new second generation DECO RIDES Boattail, as evidenced by the BUGNOTTI we are building. Stay tuned for the further adventures and thanks for taking the time to read this. I hope you enjoy what DECO RIDES has to offer, even if you never build or own one of our cars.